Colorado Workouts AND A Barefoot Run Through the Snow! BRRR! | Keep It Up, David! I didn’t fall on purpose – I tripped on something underneath the snow! You may have spotted a couple dogs in that video, actually enjoying the freezing cold conditions. The light brown one is my dog, JJ, and the dark brown one is Coco, JJ’s doggie cousin. Coco is adorable, and a labradoodle, and my sister and her family have had her for about a year and a half. Coco and JJ got along really well, and played together, literally, for hours. Sarah has a fenced in backyard, so we could put them out there and they would entertain each other endlessly, climbing on one another, chasing, wrestling, and nipping. 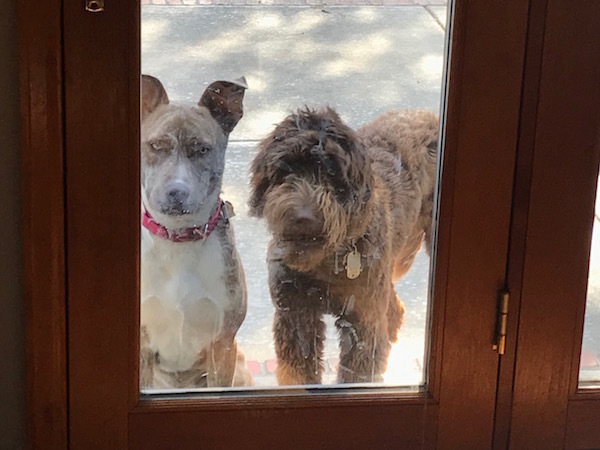 I must admit it was nice to be able to let JJ out to do his business, as opposed to walking him, and I enjoyed looking over and seeing two pups waiting to be let back in the house. And I loved that JJ got so wiped out, every day! A tired dog is a good dog. 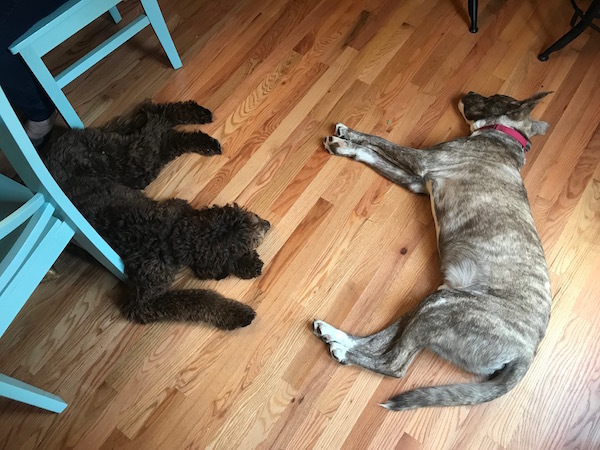 There was a third dog there, too – Conrad, who’s appeared on this blog before and belongs to my sister Laura. 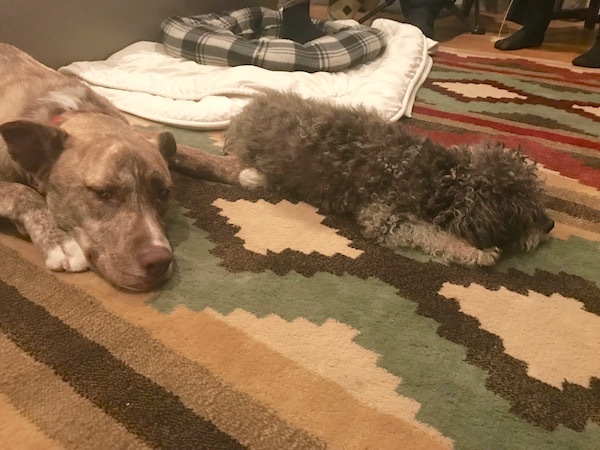 He’s a 15-year-old Yorkiepoo who is blind and almost deaf, so his interactions with his younger, much bigger doggie cousins were a little limited. But once JJ calmed down and took a break from repeatedly trying to literally nudge Conrad into playing, they got along just fine. 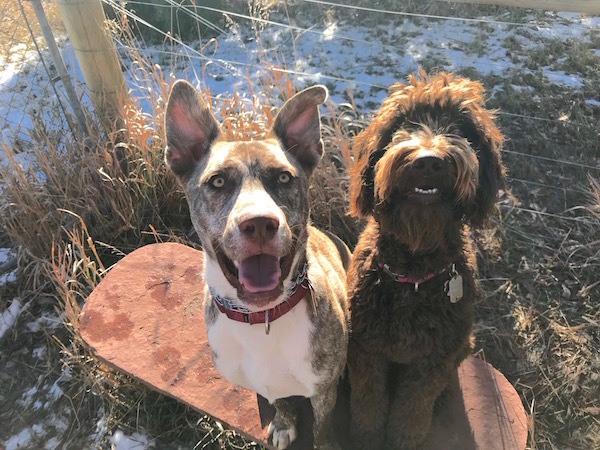 While I didn’t run in circles for hours like JJ and Coco did, I was pretty active in Colorado, although most of the exercise was not as intense as I would have preferred. I already blogged about the 5K run that I did on Thanksgiving morning, and that was the most intense thing I did in a six-day stretch. I walked on the other five days – but hey, walking is still great exercise! The first walk was in Salina, Utah, before starting Day 2 of my road trip with JJ to Colorado. We walked for 47 minutes and covered 2.1 miles – going from end-to-end of this little town with only 2,500 residents. Our route included a visit to the former POW camp where, during World War II, captured German soldiers were detained. 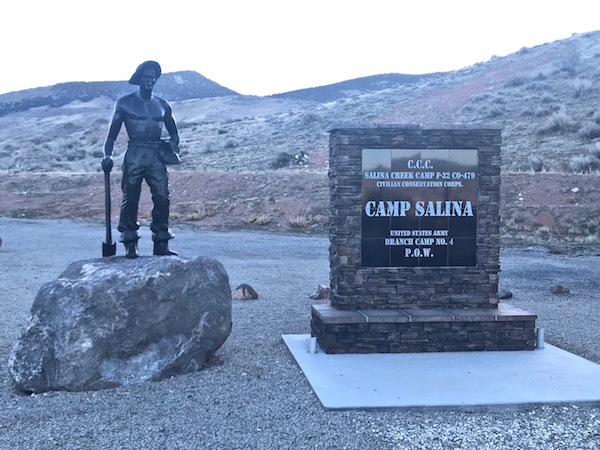 This camp was the site of the largest POW massacre in US history, when, in 1945, an American guard opened fire from a guard tower and murdered nine German prisoners and injured twenty more. The guard was ultimately determined to be insane and sentenced to a mental institution, and a museum about the camp opened on the site a couple years ago, but it wasn’t open when I was there. 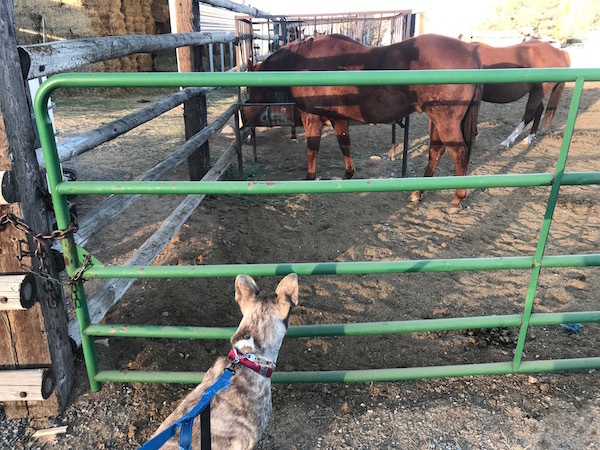 In other Salina news, JJ and I encountered a few horses on our walk, and all JJ wanted to do was play with them, even getting that bowing play pose that dogs are famous for. The horses weren’t interested and barely looked over at JJ. 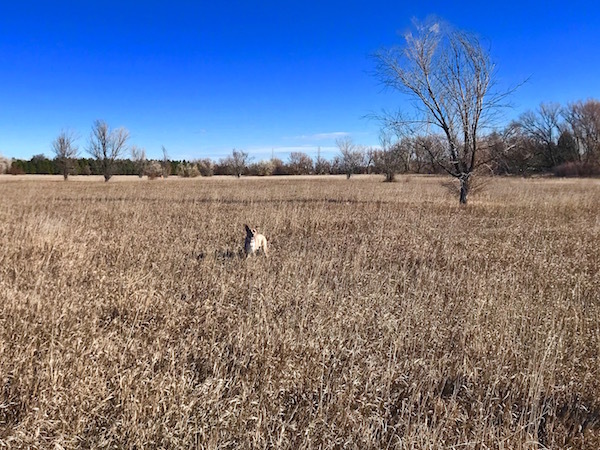 Once in Colorado, I went with my brother-in-law Justin on two walks at Dry Creek, a huge fenced-in open space where dogs are allowed to be off-leash. JJ and Coco ran the whole time, staying close and meeting other dogs as they came by. JJ was practically camouflaged by the tall dry grass. One walk was 3.5 miles/87 minutes, and the other was 2.9 miles/70 minutes. We went a third time, too, with Sarah, on the day JJ and I arrived, but we were only there for about a half hour and I didn’t record the distance. 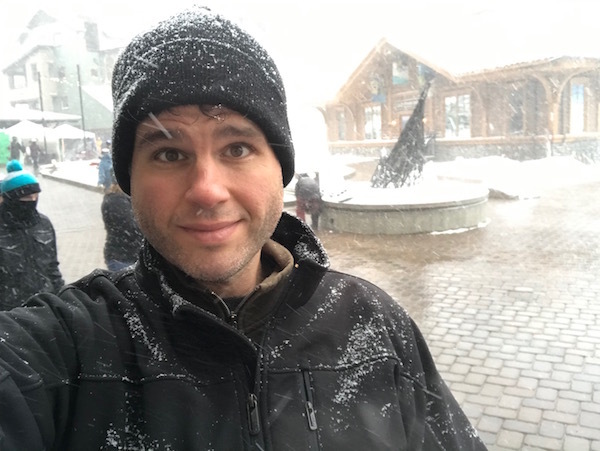 While Sarah and Justin and their kids live near Boulder, we also spent two days up in Winter Park, a ski resort town up in the mountains. 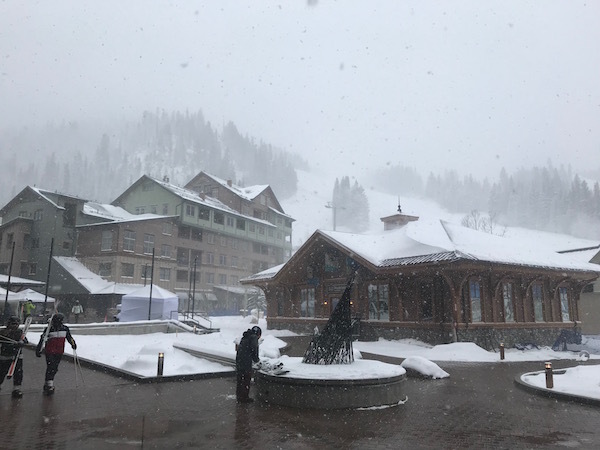 It was JJ’s first time experiencing snow, and there was plenty to go around – about 6″, plus more that continually fell our entire first day there. JJ and Coco loved jumping through snow drifts and would come back in with snow on their faces and falling off their fur. I took both dogs for long walks on both mornings we were up there, in below-freezing temperatures. One morning is was 19 degrees when we started the walk! 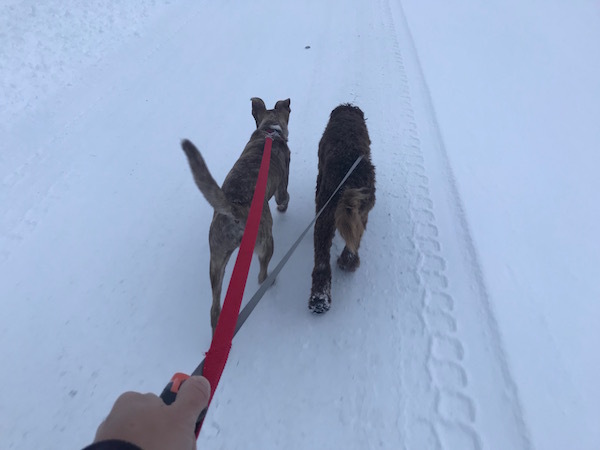 Walking two powerful dogs was a challenge, especially when paired with icy and unplowed streets and sidewalks, but it all went well. We covered 2.8 miles/63 minutes one day, and 3.6 miles/78 minutes the other. Sarah, Justin, Allison (my niece) and I went for another snowy walk in Winter Park Village, where we browsed in a couple stores and watched people ski down the slopes. There was a craft fair that day, but many of the booths were closed because it was blustery. We couldn’t even see that far up the mountain! We took a shuttle bus to and from the Village, and looked at the ski resort trail map on the way home. 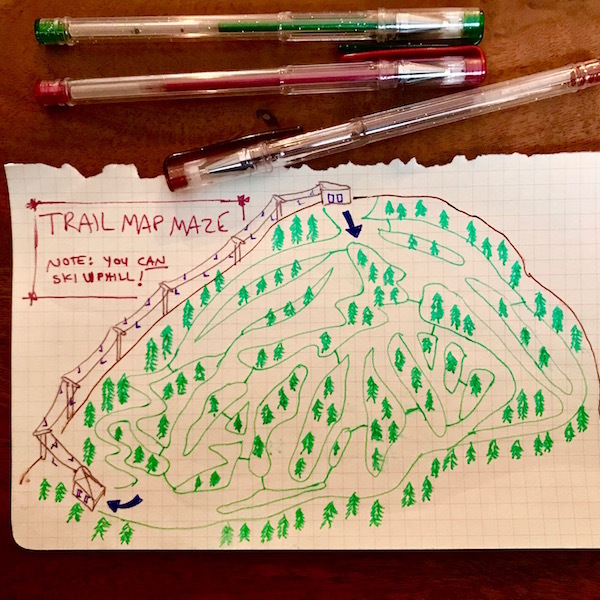 I told Allison that it reminded me of a maze, so once we got back, I drew a trail-map-inspired maze for her. We also had a family bowling night in Winter Park. There were 10 of us, split between two lanes, and I got the most points, with 122. I just looked it up, and two different websites said you can burn a couple hundred calories an hour bowling, so… yay for exercise! But I also consumed more calories than that during the excursion, because I ate a piece of pizza, two mozzarella sticks, and a cheese-filled pretzel nugget. One of the best workouts that I had on this trip, though, was on the drive home. 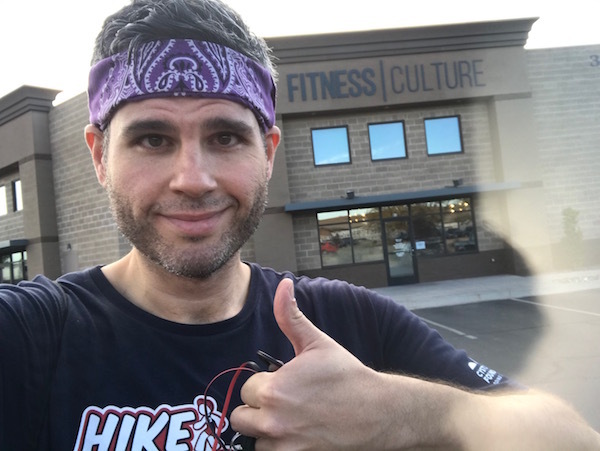 I spent the night in St. George, Utah, and before starting Day 2 in the car, I sought out a local gym and bought a day pass to get in a workout. A gym called Fitness Culture was only a couple miles away, so I popped in there. Turns out it’s the gym owned by Steve Cook, a trainer, fitness model, and extremely popular YouTube and Instagram star and influencer. (He has 1.1 million subscribers and nearly 150 million views on his YouTube channel!) I’ve seen some of his videos, many of which are filmed here, so I ended up recognizing the gym before I even began exercising. 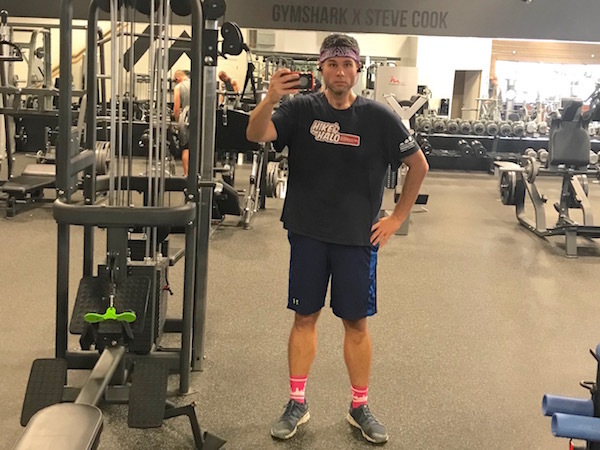 Steve wasn’t there when I was there, but he has a great, well-equipped gym, and it was easy to get a killer workout in. I did a 10-minute warm up on a bike, and then lifted weights for the rest of the hour, alternating between upper body and lower body exercises. Just what I needed in the middle of a 16-hour drive! And that covers all my workouts on my trip… except for one. 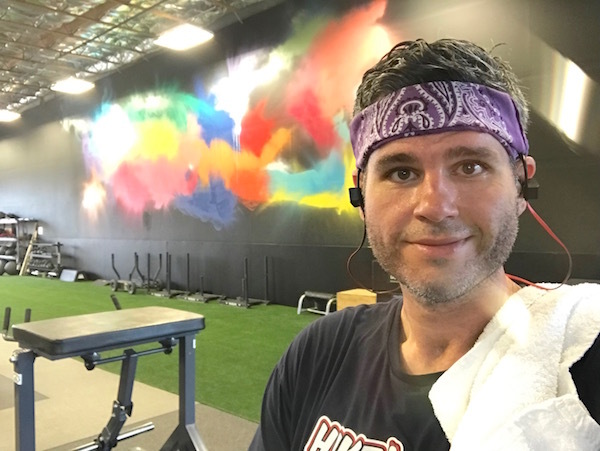 I’m giving that workout it’s own post, because it’s been on my bucket list for a few years now, and it was experience unlike anything I’ve ever done. Coming soon… in my next post. This entry was posted on Thursday, November 29th, 2018 at 11:57 am and is filed under Uncategorized. You can follow any responses to this entry through the RSS 2.0 feed. You can leave a response, or trackback from your own site. 6 Responses to Colorado Workouts AND A Barefoot Run Through the Snow! BRRR! I agree, and oops! Post updated. Conrad sure is one handsome old man! Thanks for everything – if only you had some new healthy InstantPot recipes! Enjoyed watching you run through the snow. The dogs loved it too. The dogs were thrilled to have someone in the snow with them, and not just watching from the porch!